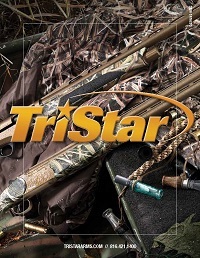 TriStar’s Five Year Warranty is specific to the function and operation of the guns offered under the TriStar Arms license. The warranty does not extend to obvious abuse or misuse of the firearm or if the firearm is used for any purpose other than hunting, competition, or sporting situations. *TT-15 Trap Models come with a 3 year warranty. Download our catalog for offline viewing and/or printing! TriStar reserves the right to change or modify product specifications without notice. All weights and measurements are nominal averages. Wood is a natural product and therefore, weights, stock dimensions, wood grains and colors may vary. Retail prices are suggested prices only and all prices are subject to change without notice.